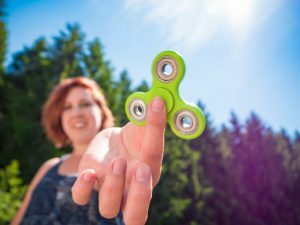 My daughter, like, I’m betting, many of your kids, has been hounding me for weeks to buy her a fidget spinner—this year’s biggest toy fad. Having survived the Rainbow Loom and affiliated rubber shrapnel in every crevice of the house, Zhu Zhu pets, Silly Bandz, and a litany of Happy Meal toys, and with both kids’ schools having banned the things, I put my foot down and said no. Over and over and over. Earlier this week, I heard her outside (in the rain) rustling through the plastic-and-glass recycling bin. She came in with three plastic bottle caps (which she washed), foraged two felt furniture-foot pads out of the kitchen catch-all drawer, and vanished upstairs. Half an hour, a visit to Pinterest, a hunk of duct tape, and a toothpick later, guess what? She’d made herself a pretty darned functional fidget spinner. Score one for the daughter. My friend, I think, is right. And here’s the lesson I’m taking from it: Next time there’s a roadblock trying to separate you from a goal, are you going to take it? Or are you going to find what you need to make your want happen?